This is our brandnew height-adjustable desk with innovative design, which provides multipleadvantages to you. It is a perfect tool for home/office using as a workstation. Spacious work area will never fail your expectation and allow you to putyour various accessories or supplies on it, including your laptop, computer,documents, cups, pens, etc.. Features solid construction and smooth desktop,this desk is very stable and easy to clean. 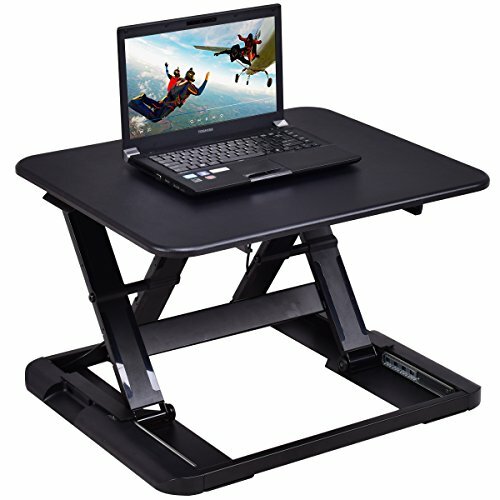 The sit-stand office desk can beadjusted vertically to meet your different demands of desired height. Thismodern and stylish computer table also takes little space on your room oroffice. Don't hesitate to buy it now! Height-adjustablewith a free positions for ergonomic comfort. ☆SPACIOUS: With a total size of 26.5x22.2" (LXW), it can perfectly accommodate your laptop or computer and various supplies can also be allowed to place on it, giving you a large area with this extra height. The standing design betters the stability of this desk and brings you a great working experience. ☆ADJUSTABLE: The sit-stand office desk with 8 height adjustment levels can be adjusted vertically from 2.3'' to 16.5" to meet your different demands of desired height. Just lifting it effortlessly, working sitting or standing can come to fruition in one second. And the stability will also be guaranteed while adjusting. ☆PRACTICABLE: It is widely applied in office or home as a perfect work station for its spacious work area. Its slim body allows you to take it to wherever you need. Constructed with a sturdy body and smooth desktop, it can be cleaned quickly and easily stand for the test of time. ☆ERGONOMIC: Reasonable height difference with desktop keeps your shoulders and neck relaxed, which enables you kill the neck strain and shoulder pain. You can work standing or sitting throughout a day wiping out tiredness and sparking your working inspiration. ☆INNOVATIVE: The innovative design of the extra height gives you plenty of room for basics and accessories with the added space. Vertical up and down of this workstation by its own support guarantees that there is no need to adjust your surrounding space to fit its movement.